Baby is forming vocal cords this week and all 20 teeth are formed, even though he/she won't get to use them for quite some time. Your baby weighs approximately 1 ounce and the placenta weighs about an ounce now as well. The baby's intestines are moving from the umbilical cord up into the abdomen. Villi are forming inside the intestines, these help in peristaltic movement and digestion. The pancreas of your little one is now secreting insulin and meconium, your baby's first stool is developing. Your baby's head is becoming more proportional to his/her body and is now one third the size of their body. 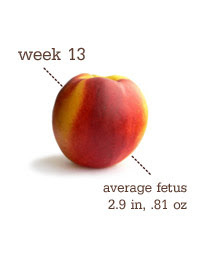 Your baby is about the size of a peach. I can't believe that "she" is growing so quick! I look forward to meeting this precious baby so much! !